8.5 AMP 11 IN. Electric Cultivator is rated 3.3 out of 5 by 3. Rated 1 out of 5 by Al Bundy from Junk Don't buy I had problems with the blades bending coming apart from the rotary attachment. I returned it back!! Rated 4 out of 5 by Small111business from Outstanding little machine Great value! Got my money’s worth in the first year for sure. I prefer this to the gas one I rented last year. 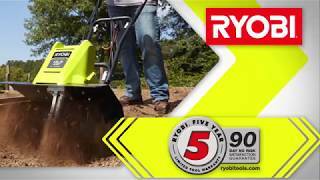 The RYOBI 8.5 Amp 11” Electric Cultivator delivers compact power and convenience. 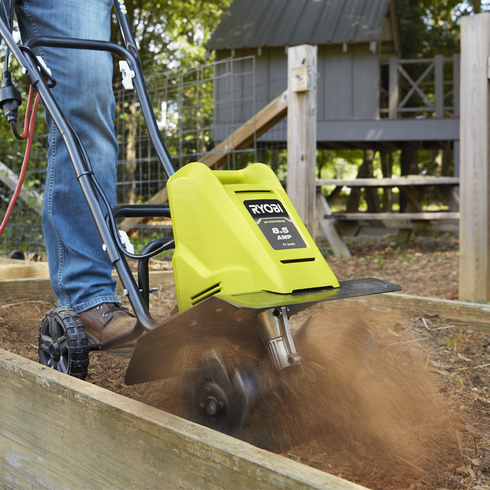 It’s 8.5 Amp motor starts with the push of a button, cultivates paths 11” wide and trenches up to 8” deep. The 4 durable heavy-duty steel tines deliver performance season after season and are ideal for gardens and landscaping projects around the home. It’s lightweight design and folding handles make setup and storage after the job a breeze.